Rostock (German pronunciation: [ˈʁɔstɔk] is the lairgest ceety in the north German state Mecklenburg-Vorpommern. Rostock is locatit on the Warnow river; the quairter o Warnemünde 12 km north o the ceety centre lees directly on the coast o the Baltic Sea. 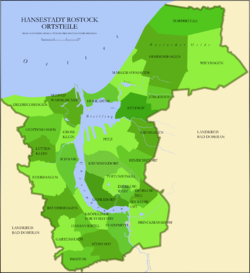 In the 11t century Polabian Slavs foondit a dounset at the Warnow river cried Roztoc (which means broadenin o a river); the name Rostock is derived frae that designation. The Dens keeng Valdemar I set the toun aflame in 1161. Neustadt (New Toun) aroond the Hopfenmarkt (Hop Mercat, nou University Square) wi St. Jakobi (St. James's Kirk, nou demolished). The rise o the ceety began wi its membership o the Hanseatic League. In the 14t century it wis a pouerful seaport toun wi 12,000 indwallers an the biggest ceety o Mecklenburg. Ships for cruisin the Baltic Sea wur constructit in Rostock. In 1419 ane o the auldest varsities in Northren Europe, the University o Rostock, wis foondit. At the end o the 15t century the dukes o Mecklenburg succeedit in enforcin thair rule ower the toun o Rostock, which haed till then been anerlie nominally subject tae thair rule an essentially independent. Thay teuk advantage o a riot kent as Domfehde, a failed uprisin o the impoverished population. Subsequent quarrels wi the dukes an persistent plunderin led ultimately tae a loss o economic an poleetical pouer. The strategic location o Rostock provoked the envy o its rivals. Danes an Swades occupeed the ceety twice, first durin the Thirty Years' War (1618–48) an again frae 1700 tae 1721. Later, the French, unner Napoleon, occupeed the toun for aboot a decade till 1813. It wis in nearbi Lübeck-Ratekau that Blücher, who wis actually born in Rostock an who wis ane o few generals tae fecht on efter the Battle o Jena, surrendered tae the French in 1806. This wis anerlie efter furious street fechtin in the Battle o Lübeck, in which he led some o the cavalry chairges hissel; the exhaustit Proushies haed, bi the time o the surrender, neither fuid nor ammunition. In the first hauf o the 19t century Rostock regained hintle o its economic importance, at first due tae the wheat tred, an frae the 1850s, tae industry, especially tae its shipyards. The first propeller-driven steamers in Germany wur constructit here. Steintor-Vorstadt in the sooth, stretchin frae the auld ceety waw tae the facilities o the new Lloydbahnhof Railway Station (nou Hauptbahnhof). It wis designed as a livin quarter an consists maistly o lairge single hooses, ance inhabitit bi walthy ceetizens. Kröpeliner-Tor-Vorstadt in the wast, designed tae hoose the wirkin population as well as smawer an lairger industrial facilities sic as Mahn & Ohlerich's Brewery (nou Hanseatische Brauerei Rostock). The main shipyard, Neptun wis juist nearbi at the shore o the river. In the 20t century, important aircraft manufacturin facilities wur situatit in the ceety, sic as the Arado Flugzeugwerke in Warnemünde an the Heinkel Works wi facilities at various places. It wis at thair facilities in Rostock-Marienehe that the warld's jet plane made its test flichts. Aeroplane construction ceased at the end o the Seicont Warld War. Lairge pairts o the central ceety wur destroyed in Warld War II bi Allied bombing in 1942 an 1945. Throu reconstruction an subsequent extension, the ceety became a major industrial centre o the German Democratic Republic wi the port bein developed as the primary gate tae the warld. Hintle o the historic centre haes been faithfully rebuilt an hintle o its historic character restored. This includes several biggins characterised bi vertical brick ribs, a style common tae the Hanseatic touns. Follaein the reunification o Germany in 1989/1990, Rostock lost its prior privileged poseetion as the principal owerseas port o the umwhile GDR an became ane o several German ports, nou locatit in ane o the least industrialised regions o reunitit Germany. Despite lairge infrastructur investments, the ceety's economy declined in the 1990s but is nou growin again. Rostock's population dropped frae nearly 260,000 in 1989 tae aboot 200,000 the day, primarily due tae suburbanisation but an aa due tae emigration tae mair prosperous wastren regions o Germany. In Rostock's lang history, the ceety carried three different coats o airms kent as the Signum, Secretum an Sigillum. The Signum, which can be traced back tae 1367, wis developed last an is tae this day the coat o airms o the ceety. The banner depicts a gowden griffin on a blue backgrund as well as the colours o the Hanseatic League, siller an reid. The coat o airms can no anerlie be seen on banners, hooses an at bus stops, but an aa on brigs, gullies, fences, ships an restaurants. Syne the 13t century, the govrening body o the ceety haes been the ceety cooncil (Rat), first consistin o ten, later o 24 aldermen (Ratsherren). The chairman o the ceety cooncil wis the ceety mayor. In the 19t century thare wur even three mayors. Syne 1925, the heid o the ceety haes born the title o Laird Mayor. Haein been electit for centuries bi the ceety cooncil, he is nou electit directly bi the ceetizens o Rostock, follaein a reform in 2002. The ceety parliament (Bürgerschaft) represents the ceetizens. Representative are electit for five years. The nummer o representatives is currently 53. The ceety parliament is presidit bi the Präsident der Bürgerschaft. He heids an prepares the sessions an, thegither wi the Laird Mayor, represents the ceety. Roland Methling (Independent), wis electit Laird Mayor o Rostock in the first roond bi 58,2% o the voters on 27 Februar 2005. Mairower, Rostock is a member o the internaitional netwirk New Hanse. 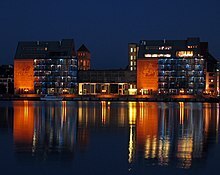 Rostock is locatit nearly centrally on Mecklenburg-Vorpommern's Baltic Sea coast. The ceety is crossed bi the Warnow. The seaside pairt o Rostock, Rostock-Warnemünde, is aboot 16 km tae the north o the historic ceety centre. The wast an the sootheast are the maist densely populatit pairts o toun. The owerseas port is tae the east o Rostock. Rostock stretches 21.6 kilometres frae the Baltic Sea tae the sooth an 19.4 km frae east tae wast. The 15t-century Kerkhofhaus (at Große Wasserstraße, ahint the Toun Haw) is considered the best preserved brick Gothic hoose in Rostock. St. Mary`s Kirk Marienkirche, on Ziegenmarkt, is an imposin Brick Gothic kirk. Built in the 13t century, it wis enlairged an modifeed at the end o the 14t century intae the present cross-shaped basilica. The huge touer wis no completit till the end o the 18t century. Inside thare is an astronomical clock biggit in 1472 bi Hans Düringer. Kröpeliner Straße - the main shoppin street. 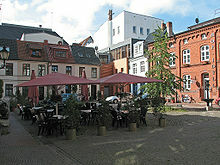 The main pedestrian precinct is Kröpeliner Straße, that runs east frae the Neuer Markt tae the 14t-century Kröpeliner Tor, a umwhile toun gate. The main biggins o Rostock University lie at Universitätsplatz, near the middle o the street, in front o the lively foontain o zest for life (Brunnen der Lebensfreude). The Kloster St Katharinen (Convent o St. Catherine), an auld Franciscan monastery foondit in 1243, an extendit several times durin the 14t an 15t centuries. Nou uised as the seat o the Academy of Music and Theatre (HMT-Rostock). The Brick Gothic Nikolaikirche (St. Nicholas Kirk), which is the auldest kirk in Rostock, biggit in mid-13t century. Hivily damaged durin Warld War II an subsequently restored, the biggin is nou uised as an exhibition centre an concert haw, due tae its ootstaundin acoustics. Some pairts o the medieval ceety waw, wi fower toun gates, still remain. Speicher (office biggins) at nicht. Heidquarters o AIDA Cruises. Warnemünde is the seaside pairt o Rostock an a major attraction o the ceety. Locals an tourists alike enjoy the maritime flair o auld hooses, a lairge beach, a lichthoose an the auld fisherman port. Furthermore, Rostock is the seivent-lairgest port o the Baltic Sea, an amang the lairgest in Germany. Rostock is hame tae ane o the auldest varsities in the warld. Foondit in 1419, the University o Rostock is the third auldest varsity in Germany in continuous operation, the seicont auldest in Northren Europe (efter St Andrews) an the auldest varsity in continental northren Europe. It affers graduate an postgraduate programmes in evangelical theology, philosophy an airts, naitural sciences an mathematics, law, ingineerin an naval airchitectur, agricultur an environmental science, medicine, state, an poleetical an social science, an an' a' maintains a botanical garden (the Botanischer Garten Universität Rostock). The Academy o Muisic an Theatre, Hochschule für Musik und Theater, affers graduate degrees in airtistic fields. Foondit in 1994, the institution combined the umwhile drama schuil Ernst Busch an the ootpost schuil o the Hanns Eisler Muisic School Berlin. The day, the schuil is a member the Association o Baltic Academies o Muisic (ABAM), a union o 17 muisic conservatories at the Baltic Sea an Israel. Unique in Europe is the postgraduate degree in piano duo performance. The schuil possesses a lairge opera stage (Katharinensaal) an twa chamber muisic haws. Thare are concerts ivery day throu the whole year. Rostock hosts an aw the Max Planck Institute for Demographic Research, the Leibniz Institute for Catalysis as well as twa branches o Fraunhofer Institutes, ane for Computer Graphic an ane for Lairge Structurs in Production Technology. The ceety is hame tae the annual Hanse Sail festival, durin which mony lairge sailin ships an museum vessels are brought oot tae sea, drawin ower 1.5 million visitors. Thare is an annual Jazz festival takin place in Juin cried Ostsee-Jazz. Rostock can be reached bi motorwa (Autobahn) A 1 frae Hamburg via Lübeck on A 20 an bi A 19 frae Berlin an A 20 frae Stettin in Poland. 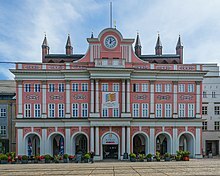 Rostock Hauptbahnhof (Rostock Central Station) offers fast rail connections tae Hamburg an Berlin an frae thare tae amaist ony ither European ceety. 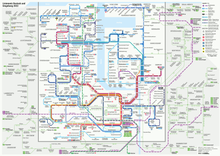 Athin the ceety a wide netwirk o trams, buses an ferries is available. The first privately financed tunnel in Germany crosses the Warnow river an sicweys connects the eastren pairt o Rostock wi the wastren pairt. Rostock is Germany's lairgest Baltic port. Rostock is an aa hame tae a lairge ferry port. It is a main base for ferry operators Scandlines, Tallink an TT-Line, which baith connect Rostock wi major Scandinavian destinations. Furthermair, Rostock receives the heichest nummers o cruise tourists in Germany per year. The nearest international airports are in Hamburg an Berlin. Thare are connecting flights via Munich tae Rostock Laage Airport. Thare are an aa a nummer o airfields for smawer aircraft, e.g. Purkshof. ↑ "Average Conditions Rostock, Germany". BBC Weather. Retrieved December 21, 2009. Wikimedia Commons haes media relatit tae Rostock. This page wis last eeditit on 20 November 2018, at 15:19.